The Bangkok Mass Transit System or BTS or Sky Train is a rapid transit system that serves Bangkok, Thailand. The system is an elevated system and began operations on 5th December 1999, and presently has 2 lines which serve 34 stations. The system is owned by Bangkok Metropolitan Administration (BMA) Mass Rapid Transit Authority of Thailand and is operated by Bangkok Mass Transit System Public Company Limited. The total system length is 36.45 km (22.65 miles). Bangkok Sky Train along with Bangkok Metro constitutes popular means of public transportation in Bangkok. The Bangkok Mass Transit System has a daily ridership of 600,000 passengers. 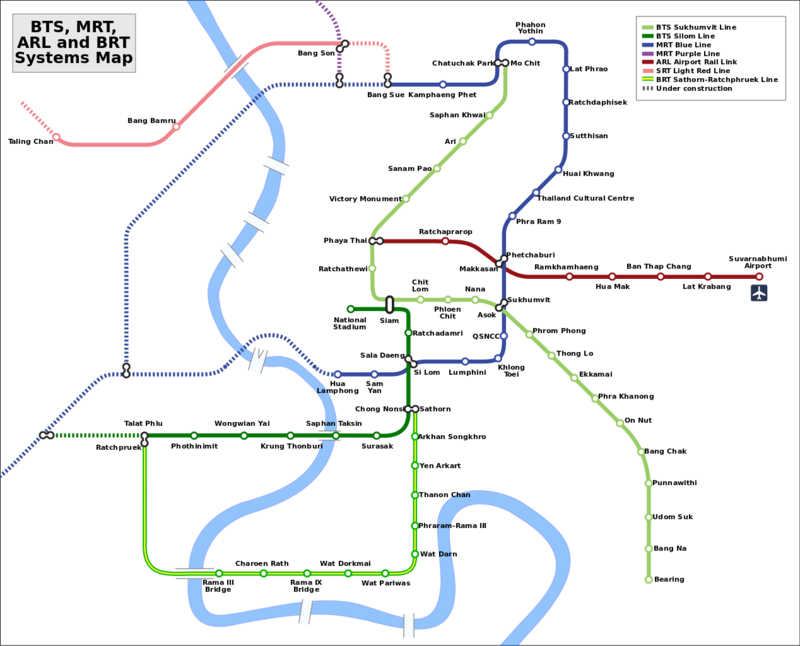 Map of Bangkok Sky Train System showing various lines and stations. Click on the map to enlarge it. You can also Download Bangkok Sky Train Map in PDF. The BTS Sky Train starts operations at 6:00 am and runs until midnight. Riders can purchase Magnetic tickets or SmartPass for making fare payments. The fare system is distance based. There are two types of Magnetic tickets, single journey ticket and One Day Pass. The minimum adult fare for a single journey ticket starts from 15 Baht and the maximum fare is 42 Baht. These tickets are valid on the date of purchase and can be bought from Ticket Issuing Machine (TIM), Integrated Ticketing Machine (ITM) and from Ticket Vending Machines (TVM).Riders can purchase a One Day Pass which provides unlimited rides for one day. It can be purchased from the BTS ticket offices. The cost of the card is 140 Baht. The SmartPass uses contactless smart card technology and has an electronic chip that stores data. A 30-Day SmartPass can be purchased for 15, 25, 40 and 50 trips. The trips are valid for 30 days after the first use, for unlimited travel distance for the number of specified trips. A 15 trip 30 day pass costs 345 Baht, while 25 trips, 40 trips and 50 trips 30 Day Pass costs 525, 760 and 900 Baht respectively. The cards should be used within 45 days from the issue date or after the trips have been last refilled. This pass is available for students as well. The student card can be used by fulltime students who are not over 23 years of age. The BTS system introduced a new type of card called Rabbit Card in 2012. In addition to BTS, this card can also be used for fare payment on the BRT. This is a stored value card and has an initial issuing fee of 50 Baht. Children with height less than 90 cm can ride the Sky Train for free. Park and ride facilities are available for passengers at BTS stations daily or monthly basis. There are more than 500 parking spaces available for BTS riders. The parking lot opens daily from 5.00am to 2.00 am. Free parking facilities are available for BTS passengers at Wave place and it operates from Saturday to Sunday, 6.00am to 10.00pm. You must get your parking ticket stamped at BTS Phloen chit station ticket office. Pets are not allowed on Sky Train except Guide dogs accompanying disabled people. The BTS provides park and ride facility at the stations. Passengers with a valid ticket can stay in the system for not more than 120 minutes after which an overstay penalty is charged according to the maximum fare. Park and ride facility is provided at stations. The BTS system has two lines, the first one Sukhumvit line running from northwards towards eastward and Silom line is the second line. At the time of opening, BTS served 23 stations on its two lines and both the lines interchanged at Siam station. Sukhumvit line – The line was opened in 1999 with a length of 22.25km. The line serves 22 stations and the sky train operates between Mo Chit and Bearing. 3 car trains run at an average speed of 35kph. The line gets connected with Silom line and runs northward direction. The line is planning further to get extended with 9 more stations. The construction of extended route will start by 2014 and schedules to get opened in 2018. Silom line – Silom line was opened in 1999 with a length of 8.7km. The line serves 11 stations and the sky train operates between national stadium and Talat Phlu. From the National Stadium, sky train runs eastward and then turns southward where it crosses the Chao Phraya River. The line was extended further for 5.3km with 4 more stations. There are 6 car shuttles to offer services to the passengers through Silom line. ● The Grand Palace: The major architectural symbol of the Thai Royal Family, the Grand Palace is 150 years old. Not only was it the official residence of the king but also of all of his administrative subjects. It’s very well known around the world for the Temple of the Emerald Buddha which lies in one corner of the Grand Palace complex. Open between 8:30-15:30, one can reach there using the Silom Line and getting off at the Saphan Taksin Station. Get out from Exit No. 2 and take the Chao Phraya Express Boat to Ta Chang Pier. From there, it is walking distance. ● Vimanmek Mansion: Recognised as the world’s largest teak mansion, it was built by Lord Rama V in the year 1990. His residence for 5 years, the Vimanmek Mansion exhibits a collection of the royal carriages used during his time.It is open from Tuesday to Sunday, between 09:30-16:00, with the exception of official holidays. To reach there take the Sukhumvit Line and get off at Victory Monument Station. Get out from Exit No.3. Walk towards Rajavithee Road and from there you can take either a taxi or a bus. ● City Pillar Shrine: Erected as a founding mark of Bangkok, the City Pillar Shrine is considered the spiritual guardian of the city. It is open everyday between, 05:30-19:30. To get there follow the same route as when you travel to the Grand Palace, it is located on Maha Chai Road which is closeby. ● Snake Farm: The snake farm holds a variety of venomous snakes. The venom from these snakes is extracted to make anti-venom to help the people unlucky enough to get bitten by such venomous snakes. It is open from Monday to Friday, between 08:30-16:00. On Saturday, Sunday and official holidays it is open between 09:30-13:00. To reach there, use the Silom Line and get off at Sala Daeng Station. Get out from Exit No. 3, from there it’s walking distance. ● Wat Sraket Ratchaworamahawihan: Also know as the Golden Mount, it is one of the most iconic and historical places in Bangkok. People can enjoy a great view of the city from its 78 metre tall pagoda. However, majority of the visitors go to worship to Lord Buddha. It is open daily between 8:00-18:00. To reach there one can take the Silom Line and get off at Saphan Taksin Station. Get out from Exit No. 2. You must then take the Chao Phraya Express Boat to Ta Tien Pier and from there one can take a taxi to Mahachai intersection.